Three musicians (Olov Johansson, Roger Tallroth, Mikael Marin) with a singular sound, a playful yet accomplished interplay that seems to defy the laws of physics, an intensity with a great sense of humor, and modernity rooted in tradition. 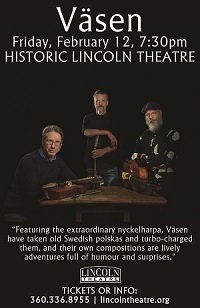 Väsen, a Swedish acoustic trio, now in its 27th year of touring together. Update as of 4/2/2019: For this tour, they are likely to be limited to performing in this country as a duo. The third member, violist Mikael Marin, has yet to receive his U.S. work visa, which is currently being subjected to something called "administrative processing," with no indication of how long it will take. The parts: a five-string viola of sophisticated symphonic taste, an adventurous 12-string guitar, and a nyckelharpa (a “keyed fiddle”) deeply rooted in the traditions of Swedish folk music. All three are instrumental virtuosos in their own right, and together they form a unique supernatural being. To experience Väsen is to witness ensemble playing at its finest. The band's origins are deeply rooted in the forests and rich earth of the Swedish countryside, in the centuries-old tradition of the folk music of Uppland. It's a tradition spiced with consummate playing skills. But this is more than just a traditional sound. There's a playfulness to their music, a joyousness, and a delight in making exciting new arrangements of centuries-old tunes, and new originals inspired by the tradition. Rock, jazz, traditional, and classical influences weave together, making a music that's beautiful but never cloying. You always hear the inspiration and improvisation of the moment. And we can promise that you’ll never know what will happen next. Advance Reserved Seating Tickets: $35 1st Section; $30 2nd Section; $25 3rd Section; $20 4th Section + applicable fees. Lincoln Theatre Members receive $2.00 off.